One of the most important aspects of creating and sharing our perspective on markets, business and the economy is that it results in often intelligent (sometimes not very) conversations that reveal multiple perspectives. Historically accurate investing requires appreciating and understanding all viewpoints and having well thought out debates. No one party knows everything at any one point in time. One interesting comment we received on our student loan article is that borrowers should invest their capital instead of paying off their loans. This depends on the interest rate on the loan and the expected rate of return. If you have a low interest rate, it could be argued that paying the minimum on the loan and investing the capital instead would be a better use of funds. You can deduct the interest you pay on student loans from your income taxes. The key is to get compound returns working for you instead of against you as we demonstrated in a previous article. This is also why credit card loans can be so deadly. The money you owe multiplies quickly if you’re only making the minimum payment. The other critical factor with student loans is being able to save money in addition to paying the loan off each month. In our previous mock example in the article Student Loans – A Generational Disaster, the student loan payments were $295.88 per month. If you make $60,000 and live in NYC, your income after taxes is $46,000 which is $3,833 per month. The mock monthly budget has $1,700 going to rent, $400 to food, $300 to utilities, $100 for transportation, $400 for miscellaneous items such as healthcare and the internet, and $300 for entertainment. In this example, the person has $633 left over to invest/save or put towards student loans. As we mentioned, for a 15 year loan with a 4% interest rate, the total spent is $53,257.53. If you decide to pay the loan off in 5 years by paying $736.66 per month and $44,199.65 in total, you save $9,057.88 in interest. One important factor to understand is that money saved is guaranteed, while the returns you get when you invest aren’t. If you take that extra $440.78 per month that you decided to put towards you loans to pay them off in 5 years and instead invested that money with a 6% annual return, you would have $30,753.23. The returns are much higher than the interest saved. This is why the commenter said those with student loan debt should invest their money as we pointed out in the beginning of the article. We think a big barrier to saving when you’re in debt is mental. Even if you’re making $60,000 per year, it feels wrong to invest your money if you have $40,000 in debt along with monthly bills to pay. However, if you invest $440.78 in a relatively safe diversified fund, it can be a better option. It lets you build wealth instead of just focusing on getting back to even. There could be losses even in a diversified fund, which don’t allow you to reach that performance, but it’s not an outlandish assumption if you don’t plan to take the money out after 5 years. We only used that time period because it’s the time it takes for the loan to be paid off quicker than necessary. It’s also critical to note that the economy operates in cycles, therefore not all times present the best risk adjusted returns. If you are planning to invest at the top of a cycle when statistically a recession is likely to occur, this would negatively impact your investments. It’s also easy to see where this math can go awry. If the interest rate on the loans is 5%, paying it back becomes more of a priority. The monthly payment is also a bit higher. If you’re not fortunate enough to get a job that pays $60,000 per year, you might not be able to save any money. Another problem is budgeting; it’s easy to spend more than $300 per month in entertainment unless you are keeping a close eye on your budget. That’s only $34.28 per non-working day. It’s easy to see why many recent graduates decide to stay home for a few years before moving out. Let’s look at a direr situation than the one previously mentioned. If you owe $60,000 in loans that you need to pay back in 10 years and you have an interest rate of 5%, the monthly payment jumps to $636.39. If you make $50,000 per year, that’s $39,000 after taxes. At this point, the budget we outlined leaves you with a deficit of $290.51 instead of a surplus of $633. We didn’t even mention the huge burden a master’s degree can be. In previous generations, recent graduates would stay at home for a couple years if they wanted to save to make a down payment on a house. Now young adults can’t even move out just to pay rent. That’s the unfortunate situation 20 somethings find themselves in when it takes an expensive education to make what previous generations made with a high school diploma. 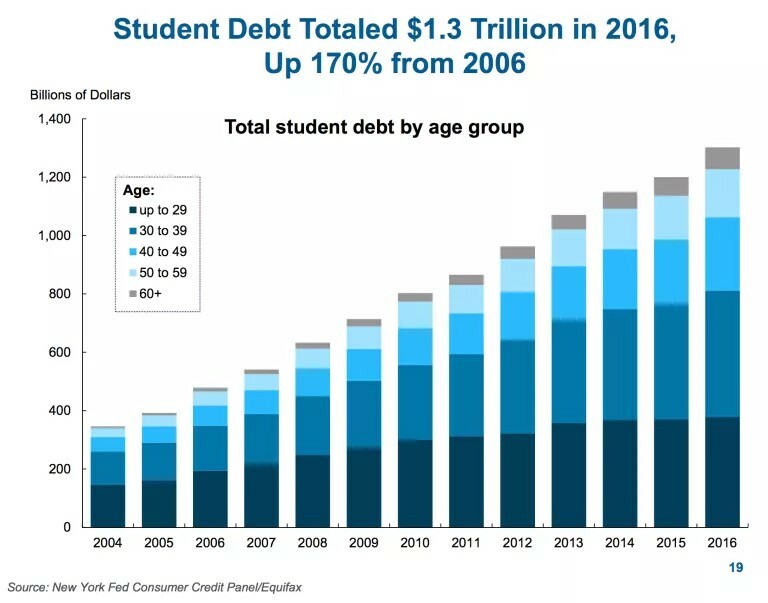 The chart below shows the exploding student loan debt in each age group. The growth in debt for those above 60 is the fastest. The average loan balance for those 60 and over was $23,500 in 2015. To be clear, the averages can be misleading in the sense that they don’t include the people who have paid off those loans. Still, the increase has been meteoric. The share of loans to those 60 and over has increased from 2.7% to 6.4% from 2005 to 2015. Taking share in a debt market that has increased in the triple digits is remarkable. The student loan crisis is hurting people’s ability to retire. Let’s quickly review the President’s proposal for student loan forgiveness. This plan would affect new borrowers in July 2019. He wants to eliminate the public service loan forgiveness program, so that everyone has the same options. The repayment plan for undergraduate loans will go from 10% of discretionary income to 12.5% of discretionary income. On the bright side, the repayment period is 15 years instead of 20 years. The current 20 year loans help explain why some people have loans in their 60s. The graduate situation is worsened by the President’s plan because the disposable income repayment goes from 10% to 12.5% and the repayment period increases from 25 to 30 years. Remember, longer is worse because at the end of the period, the loans are wiped away. Other changes are the elimination of subsidized loans, enforcement of delinquent borrowers, and more Pell grants for short academic courses. The student loan issue is massive as it prevents 20 somethings and even 30 somethings from moving out from their parents’ house, buying a house, and having kids. In the dire situation we mentioned, student loans represent 19.58% of total income per month, leaving little room for monthly bills. Trump’s plan won’t do anything to affect the current distressed borrowers. The best solution is to stop the madness. We’re seeing the borrowing growth rate decline, so the market might be preventing this problem from hurting the next generation. NextWhat To Do In A Selloff?